A voltage regulator is designed to automatically ‘regulate’ voltage level. It basically steps down the input voltage to the desired level and keeps that in that same level during the supply. This makes sure that even when a load is applied the voltage doesn’t drop. To regulate or vary the output voltage of the circuit. To keep the output voltage constant at the desired value in-spite of variations in the supply voltage or in the load current. To know more on the basics of this subject, you may also refer Regulated Power Supply. We have already explained about IC Voltage Regulators. All electronic voltage regulators will have a stable voltage reference source which is provided by the reverse breakdown voltage operating diode called zener diode. The main reason to use a voltage regulator is to maintain a constant dc output voltage. It also blocks the ac ripple voltage that cannot be blocked by the filter. A good voltage regulator may also include additional circuits for protection like short circuits, current limiting circuit, thermal shutdown, and overvoltage protection. Electronic voltage regulators are designed by any of the three or a combination of any of the three regulators given below. A zener controlled voltage regulator is used when the efficiency of a regulated power supply becomes very low due to high current. There are two kinds of zener controlled transistor voltage regulators. Such a circuit is also named an emitter follower voltage regulator. It is called so because the transistor used is connected in an emitter follower configuration. The circuit consists of an N-P-N transistor and a zener diode. As shown in the figure below, the collector and emitter terminals of the transistor are in series with the load. Thus this regulator has the name series in it. The transistor used is a series pass transistor. The output of the rectifier that is filtered is then given to the input terminals and regulated output voltage Vload is obtained across the load resistor Rload. The reference voltage is provided by the zener diode and the transistor acts as a variable resistor, whose resistance varies with the operating conditions of base current, Ibase. The main principle behind the working of such a regulator is that a large proportion of the change in supply or input voltage appears across the transistor and thus the utput voltage tends to remain constant. The transistor base voltage Vbase and the zener diode voltage Vzener are equal and thus the value of Vbase remains almost constant. When the input supply voltage Vin increases the output voltage Vload also increases. This increase in Vload will cause a reduced voltage of the transistor base emitter voltage Vbe as the zener voltage Vzener is constant. This reduction in Vbe causes a decrease in the level of conduction which will further increase the collector-emitter resistance of the transistor and thus causing an increase in the transistor collector-emitter voltage and all of this causes the output voltage Vout to reduce. Thus, the output voltage remains constant. The operation is similar when the input supply voltage decreases. The next condition would be the effect of the output load change in regard to the output voltage. Let us consider a case where the current is increased by the decrease in load resistance Rload. This causes a decrease in the value of output voltage and thus causes the transistor base emitter voltage to increase. This causes the collector emitter resistance value to decrease due to an increase in the conduction level of the transistor. This causes the input current to increase slightly and thus compensates for the decrease in the load resistance Rload. The biggest advantage of this circuit is that the changes in the zener current are reduced by a factor Î² and thus the zener effect is greatly reduced and a much more stabilized output is obtained. The output voltage of the series regulator is Vout = Vzener â€“ Vbe. The load current Iload of the circuit will be the maximum emitter current that the transistor can pass. For a normal transistor like the 2N3055, the load current can go upto 15A. If the load current is zero or has no value, then the current drawn from the supply can be written as Izener + Ic(min). Such an emitter follower voltage regulator is more efficient than a normal zener regulator. A normal zener regulator that has only a resistor and a zener diode has to supply the base current of the transistor. The limitations listed below has proved the use of this series voltage regulator only suitable for low output voltages. With the increase in room temperature, the values of Vbe and Vzener tend to decrease. Thus the output voltage cannot be maintained a constant. This will further increase the transistor base emitter voltage and thus the load. There is no option to change the output voltage in the circuit. Due to the small amplification process provided by only one transistor, the circuit cannot provide good regulation at high currents. When compared to other regulators, this regulator has poor regulation and ripple suppression with respect to input variations. The power dissipation of a pass transistor is large because it is equal to Vcc IcÂ and almost all variation appears at VceÂ and the load current is approximately equal to collecÂ­tor current. Thus for heavy load currents pass transistor has to dissipate a lot of power and, therefore, becoming hot. The image below shows the circuit diagram of a shunt voltage regulator. The circuit consists of an NPN transistor and a zener diode along with a series resistor Rseries that is connected in series with the input supply. The zener diode is connected across the base and the collector of the transistor which is connected across the output. As there is a voltage drop in the series resistance Rseries the unregulated voltage is also decreased along with it. The amount of voltage drop depends on the current supplied t the load Rload. The value of the voltage across the load depends on the zener diode and the transistor base emitter voltage Vbe. The output remains nearly a constant as the values of Vzener and Vbe are nearly constant. This condition is explained below. Â When the supply voltage increases, the output voltage and base emitter voltage of transistor increases and thus increases the base current Ibase and therefore causes an increase in the collector current Icoll (Icoll = Î².Ibase). Thus, the supply voltage increases causing an increase in supply current, which inturn causes a voltage drop i the series resistance Rseries and thereby decreasing the output voltage. This decrease will be more than enough to compensate for the initial increase in output voltage. Thus, the output remains nearly a constant. The working explained above happens in reverse if the supply voltage decreases. When the load resistance Rload decreases, the load current Iload increases due to the decrease in currents through base and collector Ibase and Icoll. Thus, there will not be any voltage drop across Rseries and the input current remains constant. Thus, the output voltage will remain constant and will be the difference of the supply voltage and the voltage drop in the series resistance. It happens in reverse if there is an increase in load resistance. The series resistor causes a huge amount of power loss. 1. The supply current flow will be more through the transistor than it is to be through the load. 2. The circuit may have problems regarding over voltage mishaps. Discrete transistor voltage regulators can be classified into two. They are explained below. These two circuits are able to produce a regulated output dc voltage that is regulated or maintained at a predetermined value even if the input voltage varies or the load connected to the output terminal changes. The block diagram of a discrete transistor type voltage regulator is given below. A control element is placed to collect the unregulated input which controls the magnitude of the input voltage and passes it to the output. The output voltage is then fedback to a sampling circuit and then compared with a reference voltage and sent back to the output. Thus, if the output voltage tends to increase the comparator circuit provides a control signal to cause the control element to reduce the magnitude of the output voltage by passing it through the sampling circuit and comparing it, thereby maintaining a constant and steady output voltage. Suppose the output voltage tends to decrease, the comparator circuit provides provides a control signal that causes the series control element to increase the magnitude of output voltage, thus maintaining the steadiness. The block diagram of a discrete transistor shunt voltage regulator is given below. As the name says the voltage regulation is provided by shunting the current away from the load. The control element shunts a part of the current that is produced as a result of the input unregulated voltage that is given to the load. Thus the voltage is regulated across the load. Due to the change in load, if there is a change in the output voltage, it will be corrected by giving a feedback signal to the comparator circuit which compares with a reference voltage and gives the output control signal to the control element to correct the magnitude of the signal required to shunt the current away from the load. If the output voltage increases, the shunt current increases and thus produces less load current and maintains a regulated output voltage. If the output voltage reduces, the shunt current reduces and thus produces more load current and maintains a regulated constant output voltage. In both cases, the sampling circuit, comparator circuit and control element plays an important role. The steady and stabilized output voltage that is obtained from the regulator is limited to a voltage range of (30-40) Volts. This is because of the small value of the maximum collector emitter voltage of transistor (50 Volts). This puts a limit to the use of transistorized power supplies. As the name implies it is a regulator with the combination of electrical and mechanical characteristics. The voltage regulation process is carried out by the coiled sensing wire to perform as an electromagnet. A magnetic field is produced by the solenoid according to the current that passes through it. This magnetic field attracts a moving ferrous core material which is connected to a spring tension or gravitational pull. When the voltage increases, the current strengthen the magnetic field, so the core is attracted towards the solenoid. The magnet is physically connected to a mechanical switch. When the voltage decreases, the magnetic field produced by the core reduces, so the spring tension causes the core to retract. This closes the mechanical switch and allows the power to flow. If the mechanical regulator design is sensitive to small voltages variations, The a selector switch can be added to the solenoid across the range of the resistances or transformer winding to gradually step the output voltage up and down, or to rotate the position of a moving coil AC regulator. In earlier automobile generators and alternators contains mechanical regulators. In these kind of regulators the process is carried out by one, two or three relays and various resistors to establish the generators output slightly more than 6 or 12 volt and this process is independent on the rpm of the engine or the load varying on the vehicleâ€™s electrical system. The relays used to carry out the pulse width modulation to regulate the output of the generator and controlling the field current passing through the generator. The regulator used for DC generators will disconnect from the generator when it was not working, to prevent the reverse flow of electricity from the battery to the generator. Otherwise it will works as a motor. This active system regulator is mostly used to regulate the voltage output of very huge generators that are commonly used in ships, oil rigs, big buildings, and so on. The circuitry of an AVR is complex and consists of all active and passive elements along with microcontrollers. The basic principle of the AVR is the same as a ordinary voltage regulator. The input voltage of the generator exciter is controlled by the AVR and when the generator voltage is increased or decreased, the output voltage of the generator automatically increases or decreases. There will be a predetermined set point on which the AVR sorts out the amount of voltage that is to be passed on to the exciter every millisecond. Thus the output voltage is regulated. The same operation becomes more complex when only one AVR is used to regulate multi generators that are connected in parallel. In some cases, a CVT is also used as a voltage regulator. A CVT consists of a high voltage resonant winding and a capacitor that produces a regulated output voltage for any type of input varying current. Like a regular transformer, the CVT has a primary and a secondary. The primary is on the side of a magnetic shunt ad the secondary is on the opposite side with a tuned coil circuit. The regulation is maintained by the magnetic saturation in the secondary coils. To know more about CVT check out our article â€“ Constant Voltage Transformer. Used with the alternator of internal combustion engines to regulate the alternator output. Note: Voltage regulators are different from Voltage Stabilizers. 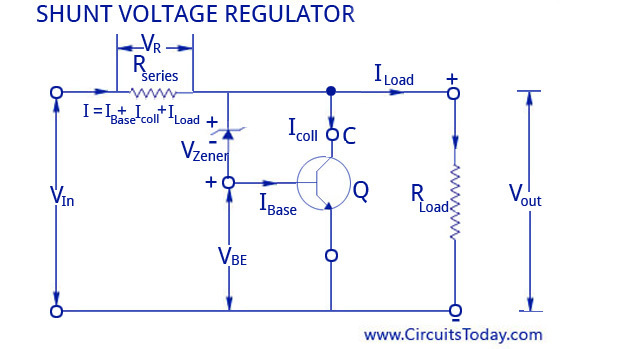 Regulators are used to step down voltages to the desired levels whereas a stabilizer ‘stabilizes’ the voltage. Regulators are mostly used for DC while stabilizers are mostly for AC. Stabilizers keep the voltages from going too high or too low so as not to damage the device connected to it, like a TV or Fridge. this is a regulated power supply, so the zenier diode will keep the voltage constant. Thanks for the post! Nice details about voltage stabilizer using (Diagram) step by step. When the input supply voltage Vin increases the output voltage Vload also increases. – Can you justify this? The transistor base voltage Vbase and the zener diode voltage Vzener are equal and thus the value of Vbase remains almost constant. – are you sure?